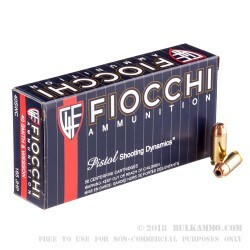 Fiocchi's Shooting Dynamics line of handgun ammunition features quality ammunition at a competitive price point. This 40 cal ammo is loaded with 165 grain Jacked Hollow Point (JHP) projectiles that are pre-skived on the jacket and include a deep cavity to encourage rapid expansion in a self-defense situation. This design is built to make it an effective self-defense load helping to create a larger permanent wound channel. Exiting the muzzle at approximately 1,100 feet per second and 443 ft/lbs. of energy this round packs a punch. Packaged in a bulk 1,000 round case this 40 S&W self-defense ammo is priced at a level that you can train with this round if you're the type of shooter that likes to practice with what you plan to carry and get lots of quality training time in. 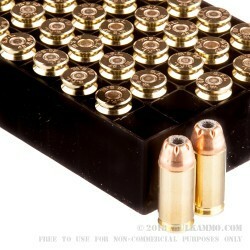 This ammo is loaded with standard boxer-primed brass cases that are reloadable and this ammo is not attracted to a magnet so it's good to go for most any range. Q: What are the ballists on this ammo ;;vec; ;; energy .ft .lbs ?? 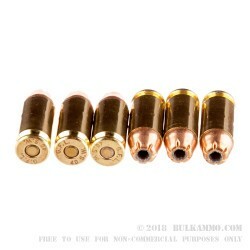 A: Hello Buzz, The muzzle velocity on this ammo is listed at 1100 fps with a muzzle energy of around 443 ft. lbs. Q: How long can this product be stored and retain it's firepower? 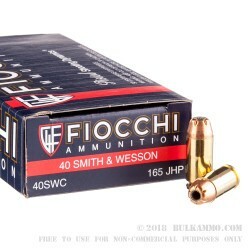 A: Properly stored in a cool and dry location, ammo like this Fiocchi .40 S&W will last for decades. Q: What does boxer primed mean and are there other methods? A: Boxer primed ammo can be easily reloaded because there is one central flash hole, which allows a decapping pin to pass straight down and remove the spent primer. The alternative is Berdan priming, which uses two flash holes that are off center and do not promote easy removal. Boxer primed is the most common, especially when it comes to American and Western European ammo. As long as both are non-corrosive (like this Fiocchi ammo), though, there are no real drawbacks to either if you do not reload.